So, after a winter of nursing diane’s leg back to health, we are ready to start on the next leg of our adventure. We have purchased 2 new-to-us ’05 KLR 650s. With an early spring here on the prairies, we were itching to get out for some riding and get a feel for these new dual sports. We stopped at the KTM dealer (no Kawi dealer in town) to order some new tires for Lind’as bald beast and toodled out to the grid roads. 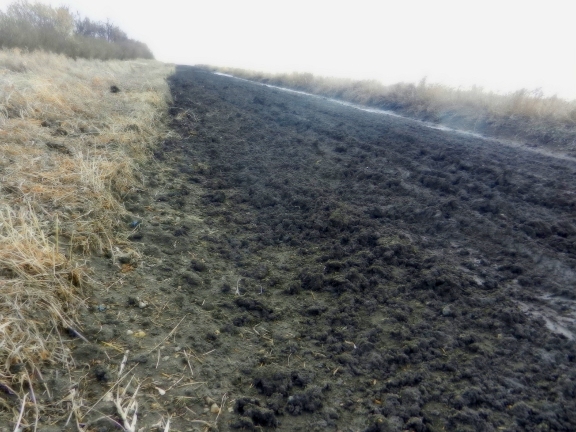 After riding in and out of ditches for about 15 minutes, we found a road marked “Impassible”. Well that sure sounded like a challenge to us! Although it doesn’t look that bad in the pic, unfortunately the road won. What made it impassible was the fact that it was wet, sucking, clay. Linda manged to get off the road into the ditch, more by chance than planning, as that was where she landed. I dumped mine withing about 5′. We got the rubber side back on the bottom, then tried to keep moving on. Linda in the ditch did pretty well. Me on the road… not so much. Stopped severl times to claw the clay out of the wheels and tried very unsucessfuly to get the monster into the ditch. Eventualy we managed to get it into the ditch, where it promptly up and died. 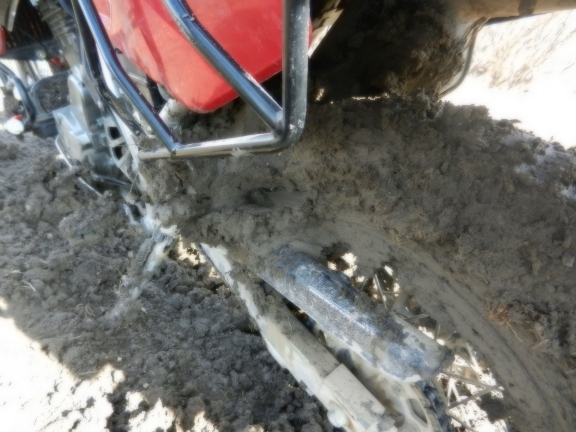 The efforts of getting off of the clay blew up the clutch. So, I think, what the H$#% now. Ah, lets see if our Harley riding friend can come and rescue us. Lucily for us he was home and drove his truck from about an hour away to came and rescue us, for which I am eternaly thankful. Unfortunately there were rude comments about import bikes and probably will be for most of the year. A small price to pay though, and he dropped it off in our driveway. The weather decided it was time to go back to being winter, so everything got put on hold for a few more days. Once the weather broke and the mud came off I set myself up in a corner of the garage and with manual in one, a wrench in the other and the bike on a shiney new motorcycle lift, pulled the cover off to see what the damage was. I was fearful that I would find broken bits of metal, but to my surprise what I found was burnt oil, burnt clutch and large amounts of clutch fibres in the case. And the crud on the pressure plate. 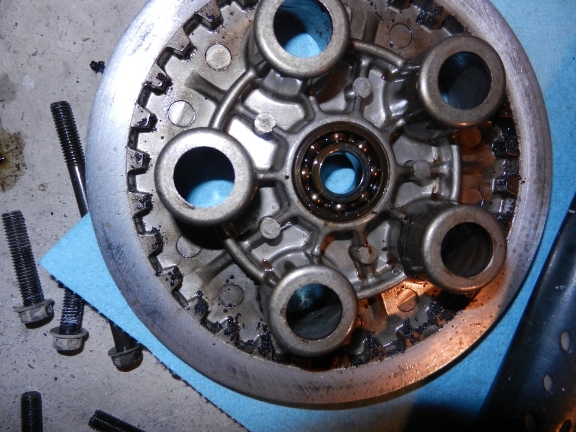 Pulled the clutch plates out and cleaned the crud out of the case. Then went in the house to see where I could order a clutch kit from. I got one from Dualsportplus.com, a company in eastern Canada. By the time it arrived a few days later, I’d had time to think of the repair a bit, and with the amount of gunk in the right side of the case and my lack of knowledge about haw the oil gets from one side to the other, figured I better pull off the left side just to have a look see. Probably didn’t need to do that, but it gave me piece of mind. There was no crud to be found. So I battened the left side back up and started putting things back together on the right side. Once again it was manual in one hand and wrench in the other. I only had pull the case off once after it was all torqued back on as I had missed greasing a couple of spots. 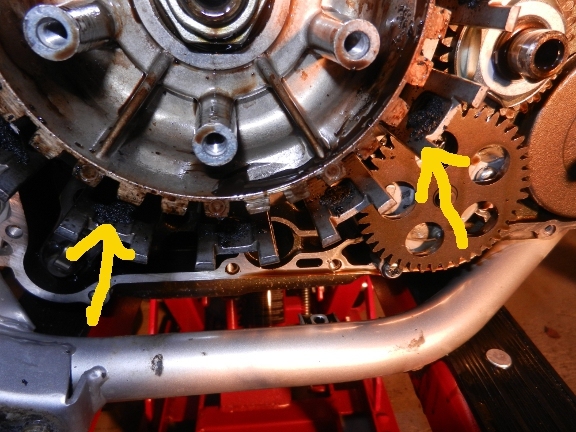 Oh and there was that issue with an oil plug… I have to pick up some more oil today and hopefuly take it on a test ride tomorrow, motorcycle goddess willing.